Get ready to place your bets! 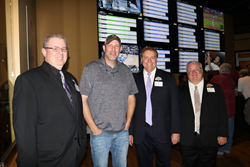 Owned and operated by the Mississippi Band of Choctaw Indians, Pearl River Resort recently celebrated the opening of Sportsbook at Timeout Lounge. As Choctaw Gaming Commission regulations for sports betting were recently approved, Pearl River Resort remains at the forefront of the gambling market with the new Sportsbook being the first tribal owned and operated independent sports betting facility outside the state of Nevada. To celebrate this momentous occasion, a ribbon cutting ceremony took place on Thursday, August 30th at 10am. Located near the escalators at Golden Moon Hotel & Casino, the Sportsbook at Timeout Lounge offers guests the opportunity to bet on all professional league sports and major collegiate sporting events in a legal and safe environment. The newly renovated, non-smoking lounge features 20 TVs with feeds to all major sports networks; three wager stations to place in-person bets; a full bar with charging stations for tablets and phones; 12 state-of-the-art wager/odds boards displaying all the games and scores; and sports bar food and drinks. The Sportsbook at Timeout Lounge is open 24/7 for guests to watch their favorite games. Counter hours of operation are as follows: Monday through Thursday from 10am-9pm; Friday from 10am-Midnight; Saturday from 9am-Midnight; and Sunday from 9am-10pm. Bettors can visit Player Services at Golden Moon or Silver Star to redeem winning tickets after hours. In the near future, kiosk and mobile wagering, where guests can place bets anywhere on casino grounds, will be available. For more information on the Sportsbook, call 1.866.447.3275 or visit http://www.pearlriverresort.com. To stay updated on all Pearl River Resort news and events, join us on your favorite social media sites: http://www.facebook.com/PearlRiverResort, http://www.twitter.com/PRRofficial, or http://www.youtube.com/user/PearlRiverResort. The Silver Star and Golden Moon Casinos feature a variety of gaming options, hotel rooms, dining options, retail offerings, conference facilities, live entertainment and a full service spa. The all-new Pearl River Resort also offers a new gaming floor with the latest first-in-state slot machines, elevated poker room, remodeled hotel rooms, a stunning video wall, refreshed buffet, updated promenade, and more. Also featured is Dancing Rabbit Golf Club with two championship golf courses and Geyser Falls Water Theme Park. Bok Homa Casino features over 720 slot machines, 12 table games, an event center and a fabulous quick serve eatery.